Career Launcher – The Integrated Career Pathways Curriculum introduces students to 300 careers across 16 clusters and provides four short academic activities for each career—a total of 1200 academic activities. Students can practice the English, math, science, and technology knowledge they’ll need on the job, while also learning about the type of work required. Career Launcher highlights traditional and emerging careers and “Bright Outlook” and “Green” careers that require varying levels of education. The program can be navigated in three ways: by career pathways, by academic subjects, and by levels of education. 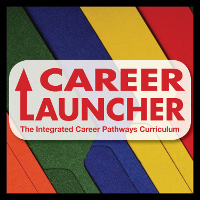 Your students at the middle school and early high school levels will be motivated by Career Launcher. You can view 18 sample careers from Career Launcher here. Click here to view Career Launcher additional description and career titles.